Source of title proper: Title based on the provenance of the collection. ca. 85 paintings and drawings. ca. 65 examples of published work. Olive Allen Biller (nee Allen) was born on October 17, 1879 in Ormskirk, England, the youngest of seven children. As a child, Allen vacationed with her family at Trebarfoot, a farmstead on the Cornish Coast. Scrapbooks from these family vacations show Allen’s artistic and creative beginnings, through illustrations, photographs, plays and poems that she contributed. She pursued similar endeavours at home, producing plays within her community and in the school that her parents ran. She attended the Slade School of Art in London (1900-1903), where her instructors included Herbert MacNair. Before immigrating to Canada, Allen’s illustrations were published in at least ten books, and wrote and illustrated stories for children’s annuals and magazines such as Blackie’s and Girl’s Realm. In 1912, Allen immigrated to Qu’Appelle Valley, Saskatchewan, to marry her long-time sweetheart Jack Biller. In 1915, Allen returned to England while Jack fought in the First World War. Jack was killed in 1916, so Allen returned to Canada as a widow with her two children, John and Jill, in 1919. They moved to James Island, near Victoria, BC, to be near her brother George. While on James Island, she was a correspondent for the Sidney Review, where she sometimes published poems and described plays that she wrote for the children to perform. In 1927, the family relocated to Oak Bay, Victoria. A lack of opportunities for illustrating turned Allen Biller toward landscape painting, and while in Victoria she showed with the Vancouver Island Arts and Crafts Society. In 1934, the family relocated once again, to Vancouver, so that her children could attend university. While in Vancouver Allen Biller took classes at the newly opened BC College of Art, studying with F.H. Varley, Jock Macdonald and Tonschek Ustinov. Between 1935 and 1947 her work was shown several times at the Vancouver Art Gallery. Allen Biller passed away in Vancouver in October of 1957. The materials in this collection were brought to Rare Books and Special Collections by Jaleen Grove, through donation by Jill Sims (Allen Biller’s daughter) in January 2007. Collection reflects Allen’s early life in England, including artistic pursuits and hobbies such as photography, poetry and writing, as well as her later artistic works from her time in Canada. The records also document her day-to-day and family life, in both England and Canada. Textual records include journals and clippings, and graphic material includes drawings, paintings, and photographs. The collection is divided into two series: Journals and Artwork. Much of the artwork and the journals are brittle; all material in this collection must be handled with care. 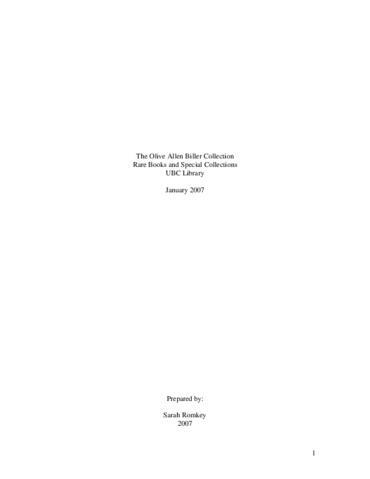 Catalogue Raisonne of Olive Allen Biller, compiled by Jaleen Grove, is available with the collection at Rare Books and Special Collections.